VICTORIA, B.C. – In a back-and-forth Sunday afternoon Vancouver Island Soccer League (VISL) Jackson Cup Final matchup at Royal Athletic Park, it was Westcastle United who earned a 3-1 result over Bays United Liquor Plus to win their first-ever Jackson Cup. 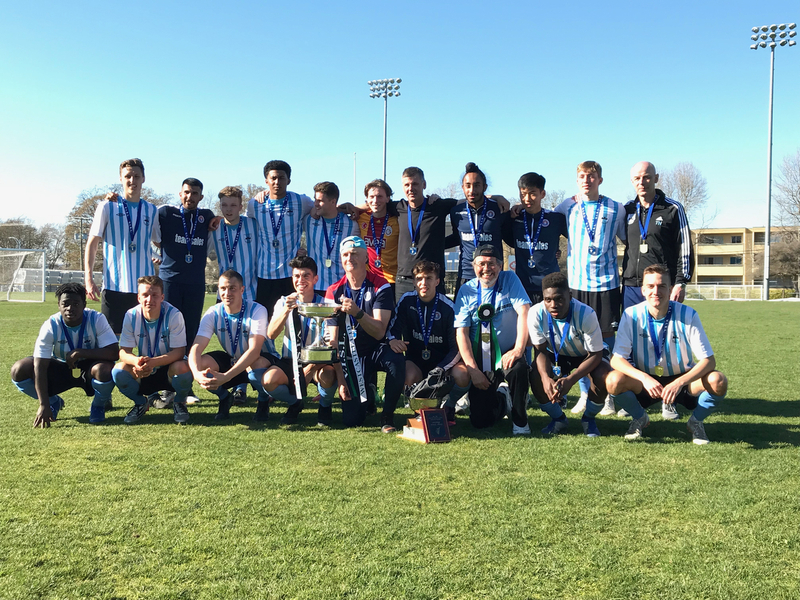 Westcastle, the Victoria Highlanders’ VISL Div 1 affiliate, finished their regular season play with an 11-3-4 record, good enough for 36 points and second-place in their division. Their path to the Jackson Cup Final saw them squaring off against Nanaimo United FC, Powell River Villa, and Comox Valley United. From kickoff, Bays United were able to apply the pressure early, but solid goaltending and strong poise from the Westcastle defensive backs turned them away. The opening goal of the game came in the 35th minute off a Joshua Walter free kick from just outside the right of the box that curled inside the far post to give Westcastle the 1-0 lead. The last ten minutes of the half saw both squads unable to break through a stingy midfield. The second half began with Westcastle coming out hard to add to their lead. It wasn’t until the 55th minute that their efforts were rewarded. After a clinical and deliberate build up, Goteh N’tignee was able to get an off-balance shot off and past the goaltender for the 2-0 lead. Moments later, Bays United capitalized on a scramble in front of the net as Patrick Nelson converted in the 56th minute to put his team on the board. After pulling within a goal, Bays United pushed hard for the equalizer, sending all hands-on deck to tie the game, but it was the young Westcastle side that would put the game away late. Sean Young gained possession and let a shot go from the right side of the 18-yard box through a crowd where Simon Stacey was able to get a piece of it to give Westcastle an insurance goal and the 3-1 lead in the 85th minute. A late header that went just wide and a couple close plays in the box weren’t enough for Bays United, as Westcastle United was able to hang on for the 3-1 win and their first-ever Sir John Jackson Cup. Goteh N’tignee of Westcastle was presented with the Denny Girvin Memorial Award for Game MVP. Well done, lads! And good luck at Provincials!